Is it Unhealthy for a 2-Month-Old Baby to Eat Cereal? While it might be tempting to give your 2-month-old cereal in the hope she’ll sleep through the night, the American Academy of Pediatrics recommends breastfeeding exclusively for the first six months of life. Babies need to be developmentally and physically ready to start eating solid foods. If you start your 2-month-old on cereal, you risk some immediate and future health problems. So enjoy the extra middle-of-the-night snuggle time while it lasts. A 2-month-old baby’s tummy is still developing. Newborns are perfectly capable of digesting breast milk and formula, but their intestines aren't ready to fully handle cereal. The cereal can move slowly through a baby’s body, which can cause an upset stomach, constipation, gas and pain. You also risk permanently damaging your infant’s digestive tract. By 4 to 6 months of age, a baby’s intestines go through a developmental change that enables them to more easily digest cereal and other solid foods, according to the AskDrSears website. A 2-month-old's intestines aren't mature enough to filter out harmful substances and only let in necessary nutrients. Immature intestines are more likely to allow potential allergy-causing foods to pass through. Your infant's immune system might produce antibodies to that food, creating a food allergy. By 4 to 7 months of age, the intestines mature and become more adept at keeping out allergens. Michigan State University School of Nursing recommends waiting until at least 4 months of age to introduce cereal because it lowers your baby’s chance of having a food allergy, particularly if you have a family history of allergies to certain foods. There’s a reason your infant sticks out his tongue when something touches it. Your 2-month-old isn’t physically capable of swallowing until he reaches about 4 months of age -- and until then, the tongue-thrust reflux helps prevent him from choking. Until this reflex diminishes and your baby is able to move food from the front to the back of his mouth, avoid giving him cereal or any other solid food with a spoon. Your baby should also be able to sit up supported and have full head control before you spoon-feed him solid foods. A reason not to put cereal in your 2-month-old's bottle is that you may overfeed her as she's not yet adept at knowing when she’s full. She's likely to overeat because her tummy can't tell her brain that she's had enough until she eats too much. Also keep in mind that by feeding your young infant cereal, you just might be increasing her odds of becoming obese. A study published in the March 2011 issue of “Pediatrics” concluded that introducing solid foods before the age of 4 months is associated with increased odds of obesity at age 3. Can 4-Month-Old Babies Eat Brown Rice? 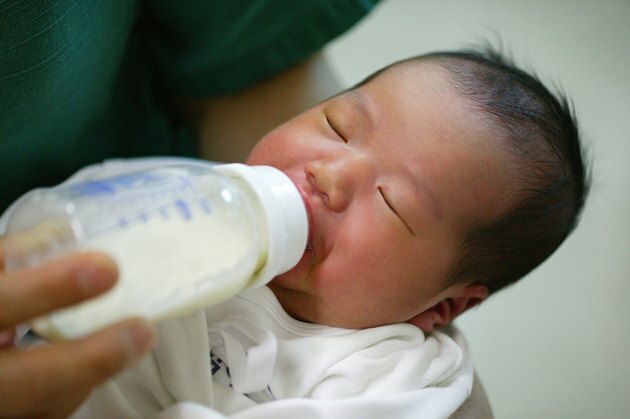 Should You Put Cereal in a Baby's Bottle? Is a 5-Month-Old Eating Apple Puree Okay?